*Quick Hero6 filter Note: The GoPro HERO6 does not require a colored filter to correct the colors when used underwater. The improved Auto White Balance, and the addition of Global Tone Mapping on the Hero6 eliminates the need for a colored filter. Please read our full GoPro Hero6 Review and see our GoPro Hero6 Auto White Balance test video for more details. Underwater Video has been changing quickly. Divers want to share their underwater adventures on social media platforms and there no easier way to capture your moment than with a GoPro camera. The GoPro is a serious player due to its small size, great video quality, features for underwater & topside use, low price point, and wide range of accessories. There is a growing number of videographers building amazing portfolios with nothing but GoPro cameras. 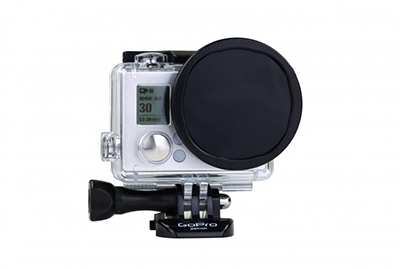 GoPro filters are used in 10-80 feet of water to help bring out the correct colors in your underwater video. GoPro filters are used to bring red color back into your underwater video, making that washed out blue or green footage pop with more accurate colors.Technically, the filter reintroduces the red color spectrum back into the picture, allowing the camera to select a more accurate white balance.The alternative to filters is to use video lights, which also bring vibrant color back into the picture, however their range is only a few feet (1m). Filters and lights should not be used at the same time, as the picture will look very red! Even though the GoPro HERO5 and GoPro HERO6 is waterproof down to 33 feet, we recommend using the Super Suit Dive Housing for freediving and scuba diving. The super suit requires filter kits built to the size of the HERO5 and HERO6. You cannot use the GoPro Hero4 and Hero3 filters on the super suit. They are too small and will not fit. If you are using the HERO5 without the super suit, then filters from the Hero 4 and 3+ should fit. Want to learn more? 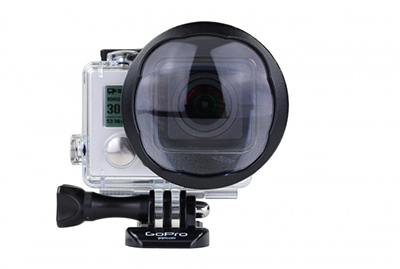 View all of our GoPro Tutorials and Articles. Red filters compensate for the lack of red light in underwater scenes (since red is the first color to be lost when descending in water). This shift in available light will often confuse the camera's white balance metering, so the red filter helps deliver accurate, vibrant color in your video, as well as much-needed contrast. A red filter is designed to be used in tropical and blue water, optimized for use between 10 and 80 feet. Best Use: Ambient light (no video lights). Blue water. 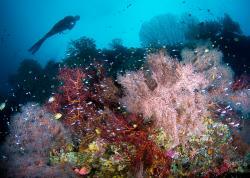 Magenta filters also compensate for the lack of red light but are optimized for green water between 10 and 80 feet. Not only do the filters bring color back into the scene, but they also help bring back the contrast needed for interesting video. Best Use: Ambient light (no video lights). Green water. Polar Pro’s macro filter provides 2.2x magnification for capturing video & photos of small subjects from a close distance. The GoPro has a minimum focus distance of 12 inches (you must be 12” or further from your subject for sharp images). This macro filter has a focus range of 2-18 inches, which allows you to move the camera closer to the small subject to fill the frame with more detail. Best Use 1: Shoot macro in combination with the Red filter (check out the Switchblade 5). No video lights are needed since the red filter brings the reds back into the scene. Or flip up the red filter and use only the macro filter with video lights. Or use just the red filter without the macro lens. 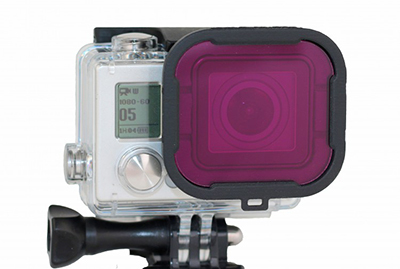 The Switchblade is an ideal GoPro filter setup since you're prepared for anything. Best Use 2: With video lights, add the macro filter to capture small details – just make sure the light isn’t too strong, which will overexpose the scene. Best Use 3: Use it for macro shots topside! *Note: The narrow view setting (used in macro) on the GoPro HERO6 can only be changed while it is outside the Super Suit housing. If you wish to shoot macro with the HERO6 then you need to slide the touch screen slider to narrow before the dive, place the camera in the housing, and then leave the camera running without making any changes the whole dive. We are hoping that a future firmware update will be made to fix this problem. Polar Pro’s Switchblade filter combines their two most popular filters (red and macro) AND allows you to use them at the same time. As discussed above, red will correct the white balance of your shots while the macro filter will allow you to shoot subjects within 12 inches and help to fill the frame with the subject. With the Switchblade you can use red and macro at the same time! Best Use 1: Shooting macro subjects without a video light (red filter flipped down). Best Use 2: Shooting macro subjects with video lights (red filter flipped up). Best Use 3: Red filter only for wide-angle shooting without video lights. The Flip5 Pro package includes 3 red filters for shallow, moderate and deep depths, plus a macro lens, and is recommended for more serious underwater video. Polarizing filters are a must in any landscape photographer’s bag, so it’s natural that you should have one for using the HERO6 topside during dive trips. The filter reduces glare (on the water, leaves, rocks, etc) and brings a bit of saturation and contrast into bright scenes (like sky and clouds). When out on location, you can hold this filter up to your eye to preview its effect and determine whether you’ll use it. Best Use: Topside photo and video on sunny days. Neutral density (ND) filters are meant for topside use and are critical for certain video/photo situations. ND filters block light, making slower shutter speeds possible. The GoPro HERO6 uses a fast shutter speed by default, which freezes action very well. There are times, however, when some blur creates a sense of movement and enhances the action in the frame. The ND filter can be used to achieve this. Examples include moving pavement while driving and waves splashing against rocks. ND filters are also very useful for timelapses, where slow shutter speeds (aka “dragging the shutter”) create slight blur, resulting in a smoother timelapse. Lastly, ND filters are very popular with drone operators, since they help reduce rolling shutter wobble. Best Use 1: Video & photos where frames need to be blurred to show speed or the passage of time. 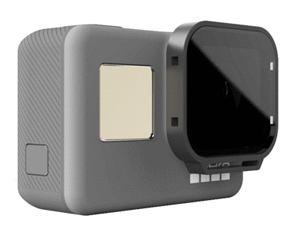 Best Use 2: Smooth video, especially for GoPro timelapses or when mounted on vibrating surfaces like a drone. The Polar Pro filters provide many creative options for your GoPro HERO6 (as well as the HERO5, Hero4, Hero 3+ and 3) underwater as well as topside. 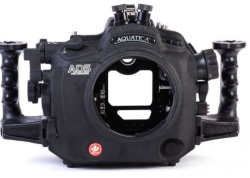 They will make all the difference in your underwater video and open creative possibilities for many unique shots. See product details for GoPro Filters for Underwater Video at Bluewater Photo: HERO6, HERO 5, Hero4, Hero 3+. We do not recommend using filters and video light at the same time. Your video will result in a pinkish hue and will not look natural. We do recommend video light without a filter. 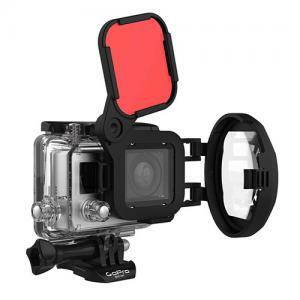 Adding the white light from a video light replaces all the lost wavelengths of colors missing at depths underwater and will help bring out the best possible colors for your underwater videos. Adding 1 or 2 video lights will be the best way for you to get the natural colors and will result in the best chances to achieving a social media worthy video to post. Video Lights come in different strengths. 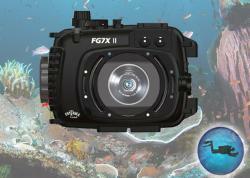 Underwater video lights are often powerful, even, and durable. They will look more powerful above water, but in most cases, underwater the light will fade in about 5 to 6 feet. The blue ambient light will quickly overpower the beam of white light from your video lights. 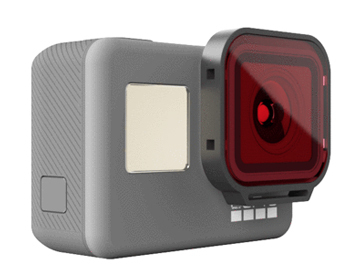 After 6 or 7 feet, you will want to go back to your red filter when using a GoPro HERO5 or less. If you are using a GoPro HERO6, you do not need a red filter.